Our weekend turned out to be pretty rainy here. I was planning to stain the deck....but due to the rain, that did not work out. Instead....I finally got around to making new cushions for the couch. The previous ones I'd made were completely dead...and I really liked this velvet fabric....It's a really nice rust colour....more so than shows in the picture. Nothing fancy....no piping...no trim...since the fabric was pretty heavy......I did not have confidence my machine would negotiate 4 layers. Four 18 inch pillow forms and 1.5 m of fabric worked out to $10 each. Measure you pillow form across from seam to seam. Mine were 18 inches across as promised. 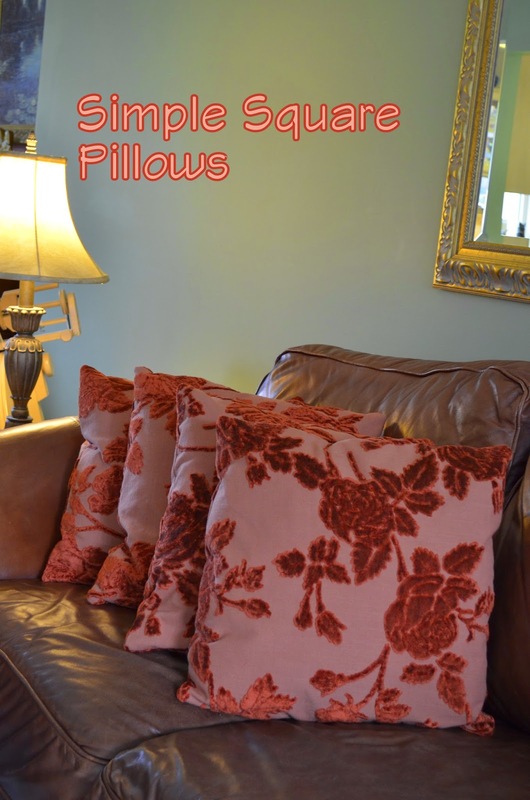 Cut 2 pieces of fabric a 1/2 inch wider in each direction than your pillow forms. I cut mine 18 1/2 inch by 18 1/2 inch. You need to angle in the corners a bit so you don't end up with really pointy corners. Set your cut fabric corner onto a cutting mat grid and using a ruler measure in 1/2 inch from the corner on one side and 5 inches down on the other...and cut along this line. Do the same across the top and you'll end up with something like what we have below. If you don't have a rotary cutting mat and cutter....just measure in 1/2 inch in from the corner and 5 inches down and mark the line with pencil and cut with scissors. Make sure to mark both pencil lines before cutting or the second one will be hard to measure. Do this to all four corners for both front and back pieces. Place right sides together and sew together with 1/4 inch seam allowance leaving 6 inches open to turn right side out. Clip corners and turn right side out. Stuff in the cushion form and stitch closed the opening.